DeLaney & DeLaney LLC has been recertified by the State of Indiana as a Women Business Enterprise. The certification is issused by the State of Indiana's Department of Administration, Minority and Women's Business Enterprises Division, and endorses us as WBE legal service providers through 2017. 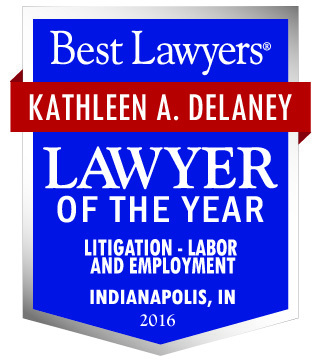 Congratulations to Kathleen DeLaney, Ed DeLaney, and Christopher Stake for being recognized in the 2015 Indiana Super Lawyers Magazine. Kathleen was included in the list of Top 25 Women by Super Lawyers in 2015, which is her eighth time to receive this recognition. Kathleen and Ed were selected as 2015 Super Lawyers in the categories of Employment & Labor and Business Litigation respectively. Christopher Stake was recognized as a Rising Star in the category of Business Litigation. DeLaney & DeLaney LLC has been recertified by the City of Indianapolis as a Women Business Enterprise. The certification is issused by the City's Minority Business Development Division, and endorses us as WBE legal service providers through 2016. Congratulations to Kathleen DeLaney and Ed DeLaney for being selected for 2014 Super Lawyers Business Edition. Kathleen has been selected for the practice area of Employment & Labor and Ed has been selected for the practice area of Business Litigation. Ann DeLaney is stepping down as the Executive Director of the Julian Center this summer. The Indianapolis Business Journal featured Ann in an article, "Julian Center's longtime leader stepping down", about her retirement from the Julian Center. The Indiana University Maurer School of Law's "Ergo" Alumni News publication includes an "alumni feature" about the "Mother-daughter super lawyer team" of Ann DeLaney and Kathleen DeLaney. The Spring 2011 Magazine notes that the firm and its partners were featured by Indiana Super Lawyers magazine in March of 2011 profiling DeLaney & DeLaney's civil litigation practice. DeLaney & DeLaney LLC has been recertified by the Women's Business Enterprise National Council as a Women's Business Enterprise for 2011.